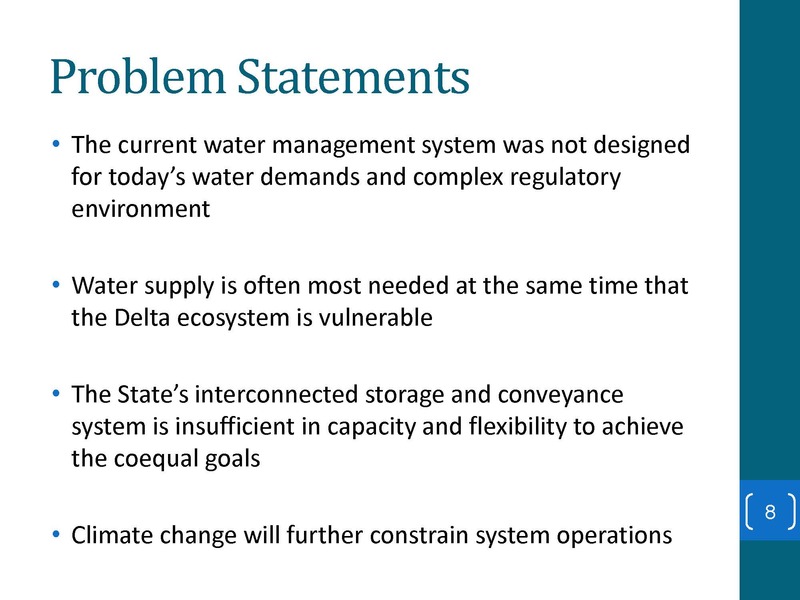 At the March meeting of the California Water Commission, Dan Ray, Chief Deputy Executive Officer of the Delta Stewardship Council, updated the Commission members on new amendments to the Delta Plan that are currently under consideration. These amendments will be the subject of a CEQA scoping meeting on Friday, March 24th. (Click here for more information). 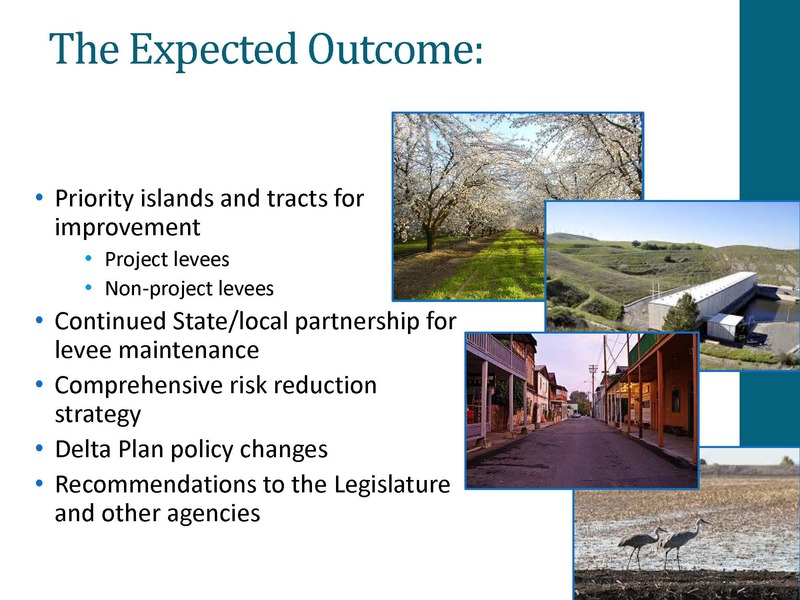 The Delta Stewardship Council is required by law to periodically review the Delta Plan and update it in response to changing circumstances and conditions. The Council has amended the plan twice since its adoption, once to adopt a set of refined performance measures and once to exempt single year transfers from the plan’s regulatory processes. Mr. Ray then reviewed the pending amendments. 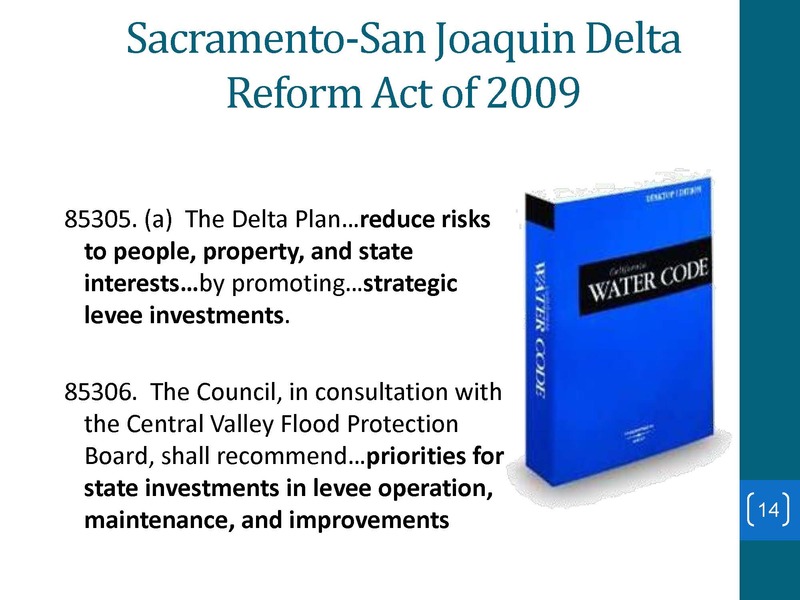 The Delta Reform Act requires the Delta Plan to promote options for new and improved infrastructure related to water conveyance in the Delta, storage systems, and the operation of both to achieve the coequal goals. 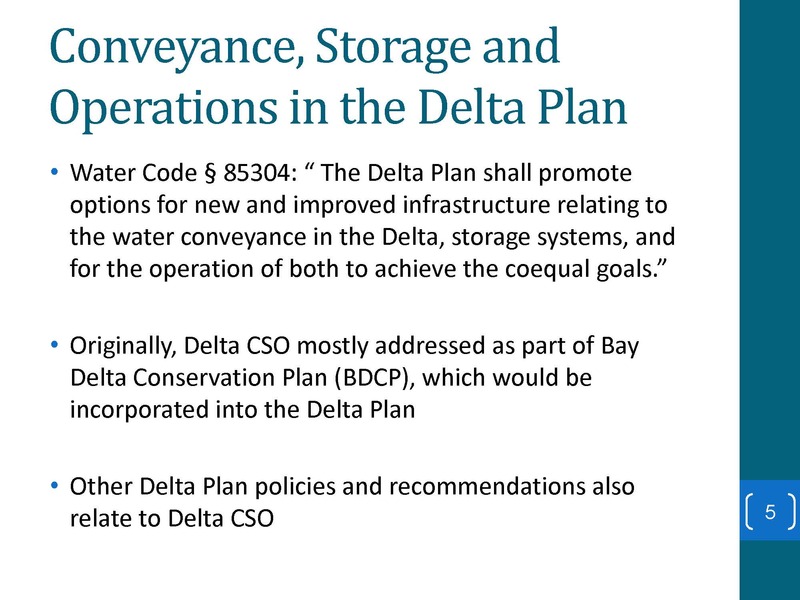 At the time the initial Delta Plan was drafted, the CalFed storage studies were still incomplete, and the Bay Delta Conservation Plan (BDCP) was being drafted as a Natural Communities Conservation Plan. The Delta Reform Act stated that if the BDCP were approved by the Department of Fish and Wildlife as meeting NCCP standards, it would automatically be incorporated into the Delta Plan. 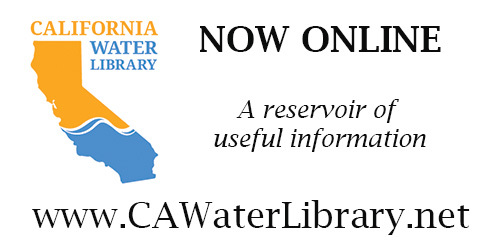 The draft amendment identifies other conveyance improvements that would be helpful, such as relocating the diversion works for the North Bay Aqueduct or improving the interconnection of water systems in the East Bay. The draft amendment also indentifies criteria that ought to be paid attention to when facilities are evaluated, designed, and implemented. In terms of storage, the draft amendment encourages the design and construction of expanded surface water storage and the implementation of new or expanded groundwater storage facilities. The draft amendment includes criteria drawn in part from the work on water storage done for the Water Commission, as well as understanding how storage can interact with the conveyance to meet the needs of the overall water supply system. Mr. Ray noted that as the amendment has been drafted, these are all recommendations and that none of these are regulatory policies. The draft is available for public review. They recently held public workshops across the state and the staff is now working to refine the discussion draft to bring it back to the Council for an additional set of public meetings. After that, a preferred alternative would be identified and the CEQA process would begin to better understand the environmental impacts and mitigation measures. 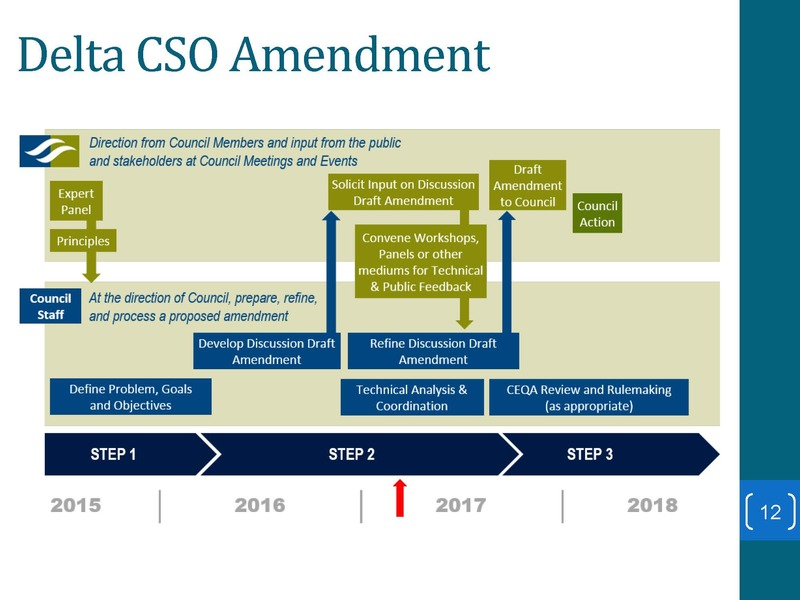 The CEQA process will occur through the summer and fall with the anticipation of the Council acting on it in December 2017 or early 2018. 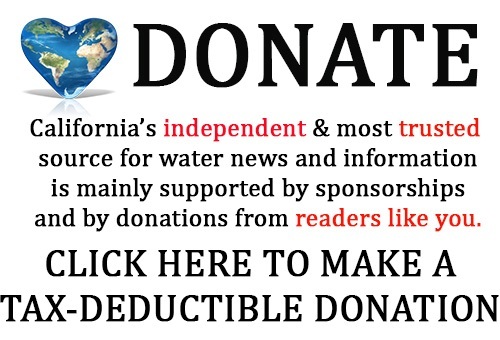 Several years ago, the Council identified the state’s interests as protecting people’s lives, their property, furthering the coequal goals of water supply reliability and ecosystem restoration while making sure we’re taking account of the Delta’s unique values, said Mr. Ray. Mr. Ray noted that this is an update to the policies and recommendations that are in the Delta Plan today. 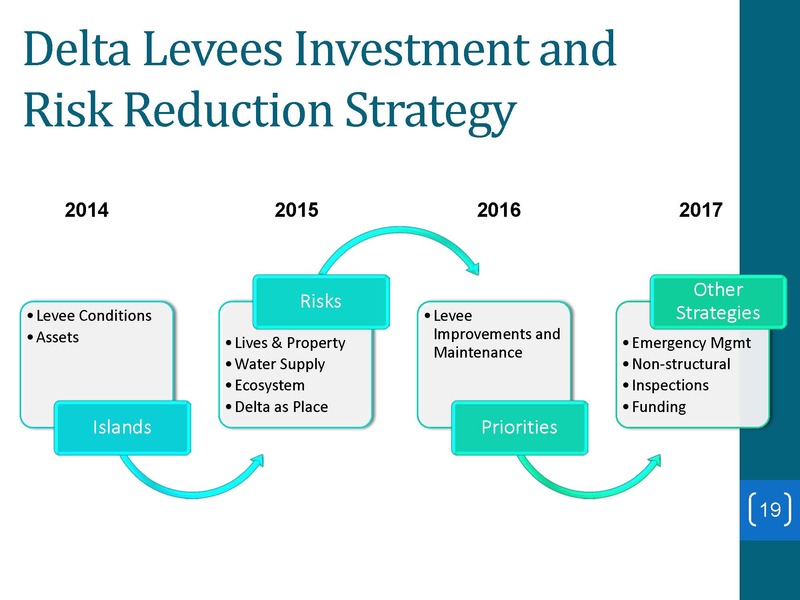 When the Council approved the Delta Plan, they knew there was more work to be done, so as soon as the initial Delta Plan was adopted, the Council began the process of more tightly describing the priorities for state investment in Delta levees. The amendment identifies both project levees and non-project levees that should be priorities for state investment. 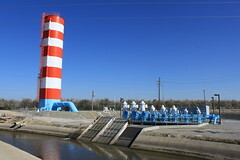 The amendment calls for continued partnership between the state, which provides the majority of the money that supports the maintenance and improvement of the non-project levees in the Delta – those that are not part of the State Plan of Flood Control and are in the rural portions of the Delta. It calls for that continued state and local partnership and recommends that the existing subventions program which subsidizes levee maintenance of the non-project levees throughout the Delta continue to be available throughout the Delta system. 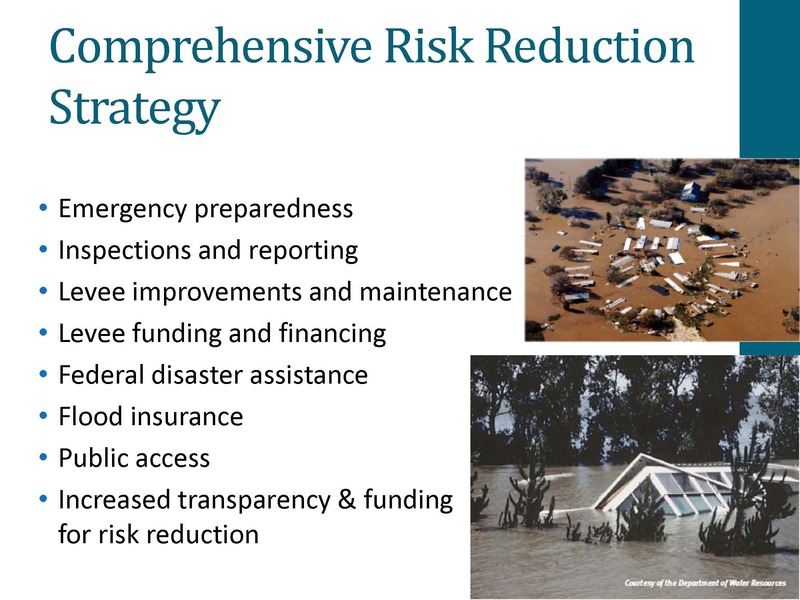 The draft amendment also lays out comprehensive complements to levee investments, such as keeping the rural areas that are flood prone in agriculture and other natural resource uses so new development isn’t placed in harm’s way and implementation of the emergency management programs that the five Delta counties have been working together with OES to improve. The amendment identifies areas that are very high priorities for levee investment, a second tier of high priorities, and then a third tier of other priorities. The amendment also makes recommendations about broadening the way levees are funded; the overwhelming source of levee funding comes out of state bond acts, an unstable and not necessarily reliable source of funding to maintain and improve essential infrastructure. So they looked at how to broaden the base from bond funding and assessments on property owners to include other beneficiaries of the levee system, such as railroads, highways, electric utilities, gas utilities and water utilities are making appropriate contributions to the levees that protect their infrastructure. The work on this amendment has been underway for over two and a half years; the amendment will be before the Council for approval at their March meeting. The amendment will be followed up with recommendations to the legislature because some of the changes the Council is recommended would require legislative action. 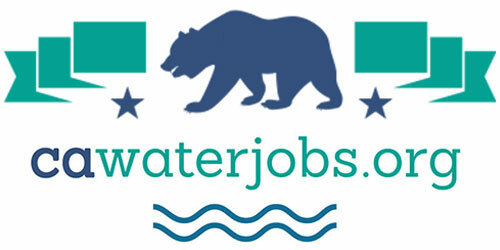 A POSSIBLE ROLE FOR THE CALIFORNIA WATER COMMISSION WITH DELTA LEVEES? Commission Chair Armando Quintero asked if the Council was looking at the levees in terms of keeping the Delta in stasis or the long-term evolution of the Delta and the levees … ? Mr. Ray said the Council’s approach is innovative in that it’s really a risk based approach. With the assistance of their consultant Arcadis and the RAND Corporation, they have gathered data about the variety of assets that the levees protect, such as water supplies, property, how many lives are at risk, where’s the prime farmland, what’s the value of islands in their current condition, where is the important habitat for wildlife, cranes, and water fowl that depend on the levee system to create the kinds of wildlife habitat they use, or how might they be valuable if levees are altered to make tidal habitats, or set back a levee to make better habitat for fish, and how does this fit into the larger plan of state flood control.